Dr. Averill received her PhD in Nutritional Sciences from the University of Washington and she now both lectures and researches in the field of nutrition, obesity, and diabetes. 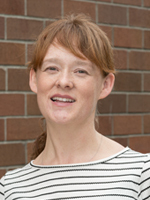 Dr. Averill is the clinical coordinator for the Graduate Coordinated Program in Dietetics at the University of Washington and she is a member of several professional organizations, including the American Society of Parenteral and Enteral Nutrition and the Academy of Nutrition and Dietetics. Diet and HDL Composition: the effect of a high fat versus a high carbohydrate meal on the proteome and lipidome in the postprandial state. Urinary sodium-to-potassium ratio and CVD: Study looking at the relationship between sodium and potassium with CVD endpoints, using urinary measures as biomarkers of dietary intake in the Multi-Ethnic Study of Atherosclerosis (MESA) cohort. Whole Food Tube Feeding Study: pilot randomized controlled trial comparing standard versus whole foods based enteral nutrition formulas in patients undergoing surgery for head and neck cancer. Achievement gap study: determining the extent of an achievement gap in an undergraduate public health science course.